Cupcakes and triathlons. That pretty much sums up my life. I train so I can eat. 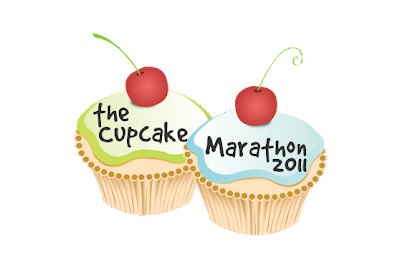 So when I came across the Cupcake Marathon, I knew that I was in good company. I wish I had found them about two weeks ago because that's when Cook Train Eat Race's Cupcake Marathon started. What's a cupcake marathon? Participants are given two weeks to run the distance of a full or half marathon. You must submit proof showing the miles and times (Garmin, treadmill, etc). When you enter, are you emailed three recipes from a cookbook. The winner of each category gets a ton of great stuff, including free cupcakes, Road ID, HoneyMilk, GU sampler pack, and much more! The winners will be chosen by random.org. This is a great way to get us motivated to run more. Of course I missed the registration entry, but I plan on participating in the one they will be hosting in the fall.